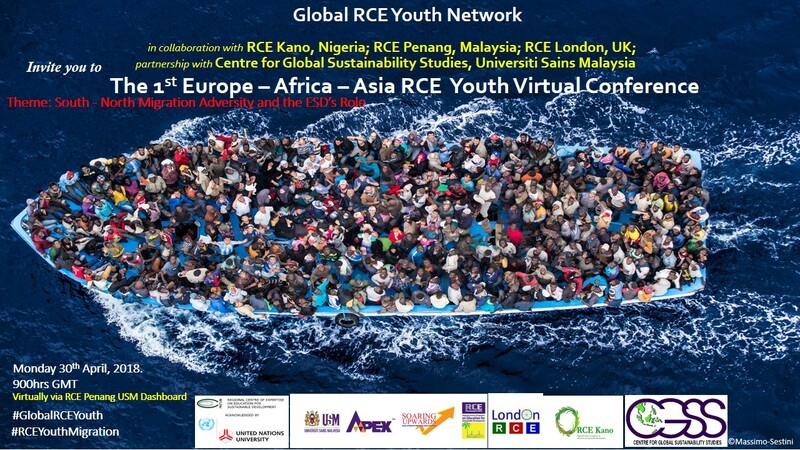 The Global RCE Youth Network in collaboration with RCE Kano, RCE London, and RCE Penang, in partnership with the Centre for Global Sustainability Studies, Universiti Sains Malaysia will bring together European, African and Asian RCEs virtually for the 1st Europe-Africa-Asia RCE Youth Virtual Conference. The theme of the conference is ‘South-North Migration Adversity and ESD’s Role’, with discussions to take place on how to address the challenges of youth unemployment, climate change, TVET and entrepreneurship, all of which trigger mass migration to Europe, as well as how ESD can assist in mitigating the associated problems. The conference will also provide an opportunity for young people to participate in solving issues that concern them and to exchange ideas and experiences on ESD, as well as discuss ways to further promote ESD at the national and global levels. Any RCE members wishing to participate are kindly requested to complete this form. Conference materials will be forwarded to registered participants in the coming weeks, with instructions and a link on how to participate to be emailed 48 hours before the conference.